As a restaurant management recruiter, I am constantly bombarded with resumes all day, every day, on weekends and holidays. It is amazing how many great managers out there can run a profitable restaurant operation inside and out, but they have no idea what to write when it comes time to shop for their next opportunity. In the restaurant industry, it isn't about where you went to school, what degree you have or what you like to do on your days off. Plain and simple is the best strategy for getting an interview in this field. You have to understand that the hiring managers who review your resume see more resumes than I do any given day. We are talking in the mid hundreds depending on how they have their needs and job hiring goals presented to the public. 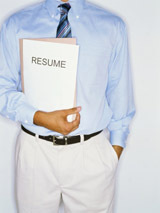 Many times a resume is passed over because it isn't user friendly or it is out of order chronologically. The worst thing I ever saw was a resume that stopped over two years ago with no explanation. Go ahead and file that one in the round outbox on the floor. Before we get started, let me tell you that if you are not using Microsoft Word you will probably never get another job. Compatibility is the key here and whether you like it or not, Word is the king of word processing software. Please don't try to reinvent the wheel using Word Perfect or something else obscure in the marketplace. When someone gets a file that can't be opened with their existing software, they take the path of least resistance and delete it. They don't try and contact you via email and you just lost a potential career opportunity. So, step one is always use Word or you will regret it later. The first thing a resume should have is your name centered in 14-point bold Arial font. Arial is easy on the eyes and it doesn't distort like some other fonts. Under that you want to put your address and phone numbers a smaller 10-point Arial. You do not need an email address on there and remember just because you have a cute or clever email address that your friends think is cool doesn't mean anyone else will. And for your sake, please change the messages on your phones to something clear and precise and welcome in the job arena. This is not the time to express yourself! The second thing you need is an objective statement, which looks great in 12-point Arial. I would suggest keeping the text size and font the same for the rest of the résumé. This objective description should be clear and driven. Don't ramble on for three sentences and think anyone will care, because they won't. For example, a nice statement about how you want to contribute to the bottom line profitability of a team using your past experiences often works well. Throw in some upward growth potential and you're on the right track. Next is the most important part and that is experience. Starting from the present and going back is the only way to go. All you need here is the name of the company, your title and the dates (from past when to present when). Don't worry about exact dates, but do include months and the years obviously. After that you will need to briefly bullet statements regarding actions while in that position. These should be one-sentence statements that are clear to the reader. Don't tell them you are a great manager because that is vague. Instead tell me why I should hire you. For instance, did you increase sales over a two-year period or did you increase sales by 12% over a two-year period using local store marketing and targeting repeat guest counts? Do you see the difference? One statement keeps you reading and one is clouded in vagueness. Take this and run with it on all other details such as labor, food and controllable costs. Any training and development of team members is also a very good example that you are part of a team and you care about their success. Because of this, you will also be successful and it will help you delegate lesser jobs onto key hourly team members. If you follow these guidelines, you will probably have about six to eight bulleted statements that should get you noticed. Repeat these steps for all your previous positions as well until you have described your last five to eight years depending on the time frame of your career. No one cares about what you did 15 years ago in this field. They want to see the most recent performance and some career progression. As far as references go, I would consider them a waste of space. No one is going to ever list a reference from a bad experience and hiring managers know this. If you have a great looking resume that flows and is widely acceptable, you will be getting far more calls from interested parties than those others who don't invest their time upfront. GreatMgrs.com is a restaurant management recruiting firm specializing in the placement of managers in all capacities of the restaurant industry. From quick serve to casual and all the way up to senior level area supervisors or district managers, we can find the right candidate for any situation or job order.